Sony's 80GB PS3 is $300 starting tomorrow and its similarly priced 120GB PS3 Slim is just a few weeks away, so how does a 25% price cut stack against the competition? Have a look at my chart below and see for yourself, and just remember, everyone has different wants and needs. Some people don't care about Wi-Fi and work around it with an Ethernet cable. Others think $50 a year for the "privilege" of playing online multiplayer is exorbitant. Don't assume those bottom line prices are necessarily your bottom line. Use the chart as a build-it-yourself tool. 1. I've baselined with the 120GB hard drive this time around (see last time) since in my view it's become the minimum standard for juggling downloadable movies, games, music files, etc. (In fact for me, 120GB is almost too small.) That said, you can certainly build out an Xbox 360 Arcade with the $50 cheaper 60GB hard drive if you like, or stick with the Xbox 360 Pro's default 60GB. 3. 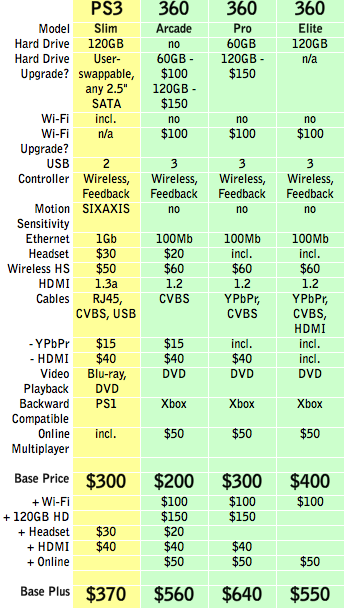 All accessory prices taken from Gamestop, accessed 8/18/09. You can certainly find better deals if you shop around. As always, I picked a popular retailer to level set. 4. Remember that the above chart doesn't gauge the "soft" value of features like Xbox LIVE or PlayStation Home or any of the many intrinsic (by design) or gratis services included with either system. 5. 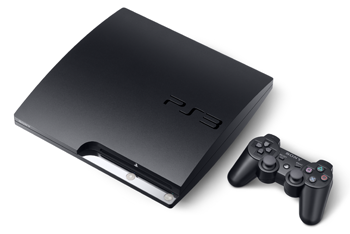 Update: Engadget reports the PS3 Slim's hard drive bay is swappable. I've adjusted the chart accordingly.